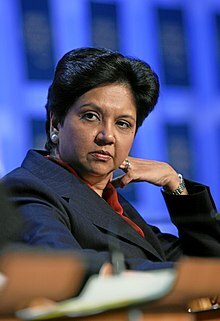 Indra Krishnamurthy Nooyi (born October 28, 1955) is an Indian-born American businesswoman who is credited with restructuring and diversification of soft-drink manufacturer PepsiCo,Inc.’s brands and making it a profitable enterprise. She became Chief Executive Officer of PepsiCo, the second largest food and beverage business in the world by net revenue in 2006. She Chairman of the board since 2007. She has consistently ranked among the World's 100 Most Powerful Women. In 2013, she has been ranked 10th in the list of Forbes World's 100 most powerful women. As a CEO, I am finding that I have to become a learning CEO. I have to go to school all the time because I am learning new skills that I need to run this company and I am realising that I am not equipped to just coast, I have to constantly renew my skills. Quoted in "A Learning CEO Can Power Through Tough Times: Indra Nooyi". Forbes India. 5 December 2013. Retrieved on 18 December 2013. Leadership is hard to define and good leadership even harder. But if you can get people to follow you to the ends of the earth, you are a great leader. As a leader I am tough on myself and I raise the standard for everybody; however I am very caring because I want people to excel at what they are doing so that they can aspire to be me in the future. Quoted in Together with Business Studies XI. Rachna Sagar. pp. 225–. ISBN 978-81-8137-098-3. Do you remember campaigns like Keep America Beautiful? What about ‘buckle up’? I believe we need an approach like this to attack obesity. Let us be good industry that does 100% of what is possibly can-not grudgingly, but willingly. Her exhortation to her executives with her mantram “Performance with a Purpose” quoted in Nelson, Debra L.; Quick, James Campbell (9 February 2010). Organizational Behavior. : Science, the Real World, and You. Cengage Learning. pp. 99–. ISBN 978-1-4390-4229-8. [moot issue is that ] we should talk about is not just lessons in leadership or what the leaders need to do today but what can India do to bring those leaders back to India, so India itself can become an even more powerful economy going forward. Quoted in "A Learning CEO Can Power Through Tough Times: Indra Nooyi". I am a mother first, then a CEO and then a wife. Quoted in Indra Nooyi: The lady with a fizz. Sify.com. Retrieved on 18 December 2013. You cannot deliver value unless you anchor the company's values. Values make an unsinkable ship." Code of conduct goes beyond legal compliance and every employee needs to be well versed with it. Quoted in "Fundamentals of India are strong: Indra Nooyi". There were many times that I felt like a fish out of water, times that I really said to myself, 'do I even fit in'. Quoted in "How PepsiCo CEO Indra Nooyi gave up cricket for baseball!". Economic Times. 25 March 2012. Retrieved on 18 December 2013. At the end of the day, don’t forget that you are a person, don’t forget you are a mother, don’t forget you are a wife, don’t forget you are a daughter. Because in the end, no matter how much money you make and how much success you create, What you are left is family, friends and faith. Quoted in "Sun Tzu for Women: The Art of War for Winning in Business" in page=113. Bring together what is good for business with what is good for the world. Quoted in "Sun Tzu for Women: The Art of War for Winning in Business", page=131. Each of us in the US - the long middle finger - must be careful that we extend our arm in either a business or political sense, we take pains to assure that we are giving a hand, not the finger. Unfortunately, I think this is how the reset of the world looks at the US right now. Not as part of the hand-giving strength and purpose to the rest of the fingers –but instead scratching our nose and sending a signal. When she drew compassion with the five most populated of the seven continents of the world in a lectuere which created a furore necessitating an apology from her. Quoted in . Branson, Douglas M . (15 December 2009). The Last Male Bastion: Gender and the CEO Suite in America s Public Companies. Routledge. pp. 98–. ISBN 978-0-203-86566-8. I have an immigrant mentality, which is that the job can be taken away at any time, so make sure you earn it every day...immigrants come here they have no safety net-zero. I landed here with $500 in my pocket. I had no one here to pay for me. Quoted in Burnison, Gary (16 March 2011). No Fear of Failure: Real Stories of How Leaders Deal with Risk and Change. John Wiley & Sons. pp. 29–. ISBN 978-1-118-02306-8. "Stay calm during turbulent times: Indra Nooyi". The Hindu. 15 November 2013. Retrieved on 18 December 2013. Turbulence is the beginning of a fruitful process of transformation. First, accept that turbulence is here to stay. Most successful companies are those that stay calm and think down to earth rather than showing aggressiveness to shorten the crisis period. Don’t take an eye on the short term but think long. One should not shy away from creating an environment of adaptability. You cannot deliver value unless you anchor the company’s values. Values make an unsinkable ship. "CEOs need to change: Indra Nooyi". Economic Times. 16 May 2009. Retrieved on 18 December 2013. Aristotle once said that the unexamined life is not worth living. I think it's time to examine what we do once more in the spirit of a critical friend. Let's pause for a moment to consider what we need to examine. I think there are at least five ways in which job description will change. The CEO has to think long-term and needs to understand the way public and private sectors are coming together and work constructively within that framework. CEOs need to make the phrase "think global and act local" more than a cliche? CEOs need keep an open mind so they can adapt to a rapidly changing world and need to bring an abundant dose of emotional intelligence to the job. The whole perspectives in which companies are viewed needs to shift from short to the long-term, and as I would say, to a focus on shapes, not just numbers. "Top 15 quotes from PepsiCo CEO Indra Nooyi". India TV. 12 Nov 2013. pp. 1 to 15. Retrieved on 18 December 2013. "I will make a prediction, that anybody who's in the [beverage business] today will get into dairy, without a doubt. I grew up in a Hindu household but went to a Roman Catholic school. I grew up with a mother who said, 'I'll arrange a marriage for you at 18,' but she also said that we could achieve anything we put our minds to and encourage us to dream of becoming prime minister or president. To lead in an ever-changing world, leaders must adapt and stay nimble. I'm very honest - brutally honest. I always look at things from their point of view as well as mine. And I know when to walk away. I think innovation as a discipline needs to go back and get rethought and revived. There are so many models to talk about innovation, there are so many typologies of innovation, and you have to find a good innovation metric that truly captures the innovation performance of a company. My father was an absolutely wonderful human being. From him I learned to always assume positive intent. Whatever anybody says or does, assume positive intent. When I grew up there was no web, blogging or tweeting. In fact, where I grew up there was not even television! I met a lot of my friends in school and in college, and they are still my friends today. I pick up the details that drive the organization insane. But sweating the details is more important than anything else. Anything that's done to address unemployment in terms of massive stimulus spending is going to exacerbate deficits. And anything that's done to address deficits in the short-term is going to exacerbate unemployment. We are in a bit of a policy box and it's going to require us being willing to give up one of the two, which is it's okay to take on more deficits but lets put in some massive spending. Alternatively to say, 'we're going to go through structural unemployment for a while because we want to address deficits. Narendra Modi question elicits 'no comment' from PepsiCo chief Indra Nooyi. Financial express (12 November 2013). Retrieved on 18 December 2013. Our hope is that whosoever is in power, manages this country consistently for all the potential the country has. I have no comments on political situations. I speak as the CEO of a large multinational company. Countries like India should be successful for the long term because India needs growth. India needs to grow at 7 to 8 per cent to ensure full employment and we all will do our part to invest in India to make sure India achieves its growth potential. We are not guided by elections. We are guided by potential of India. We are not waiting for any election results to invest in India. We are investing in India for its economic story. Look, when you pull into the garage, leave the crown there. Don't walk in with it, because you are first a wife and a mother. And if the family needs milk, you go get the milk. That is your primary role in life. Everything else is what you acquired or what you got because I pray for four to five hours a day.' That is the only thing she tells me. Her mother’s advice quoted in "Fundamentals of India are strong: Indra Nooyi". Economic Times. 15 November 2013. Retrieved on 18 December 2013. One such way was to do with her lifelong love of cricket. No one in this country (the US) followed the game, but they did follow baseball, another bat-and-ball sport. So she threw herself into baseball and into the local team, the New York Yankees, reading everything she could on the subject until she could comfortably talk about it. Quoted in "How PepsiCo CEO Indra Nooyi gave up cricket for baseball". Nui is a different kind of CEO. He says her approach boils down to balancing the profit motive by making healthier snacks (in speech to the food industry, she pushed the group to tackle obesity), striving for a net zero impact on the environment and taking care of your workforce. She was one of the first executives to realize that the health and green movements were just not fads and she demanded true innovation. Quoted in . Lussier, Robert N; Achua, Christopher F. (1 February 2009). Leadership: Theory, Application, & Skill Development: Theory, Application, & Skill Development. Cengage Learning. pp. 151–. ISBN 978-0-324-59655-7. Indra can drive as deep and hard as anyone I have ever met, but she can do it with a sense of heart and fun. Roger Enrcio, Chief Executive, quoted in Runkle, Beck Sheetz- (18 December 2010). Sun Tzu for Women: The Art of War for Winning in Business. Adams Media. pp. 112–. ISBN 978-1-4405-1178-3. As someone who has always aspired to build a company committed to its people and to the world, I admire her determination to achieve sustainability at an established company like Pepsi Co. And I believe that all socially responsible companies could learn from Indra Nooyi’s style of leadership. Herbart Schultz, President and CEO, Starbucks quoted in "Together with Business Studies XI" in page=135. Indra Nooyi. Encyclopedia Britannica. Retrieved on 18 December 2013. 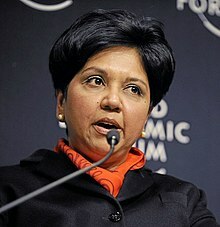 Indra Nooyi ’80 M.P.P.M.. Yale University. Retrieved on 18 December 2013. This page was last edited on 10 October 2018, at 14:19.